Nobody wants a smelly air conditioner. But it does happen sometimes. One day you have a great smelling home. The next day, you are smelling something funny from your air conditioner. One thing is for sure. There is something wrong with your cooling system if you start smelling a funky odor from it. An air conditioner is not meant to produce any smell. You want to remove this as soon as possible because it might compromise the health of your family. Obviously, the primary reason to act on it immediately is it is uncomfortable to keep on smelling that foul odor. But other than that, it can lead to illnesses. 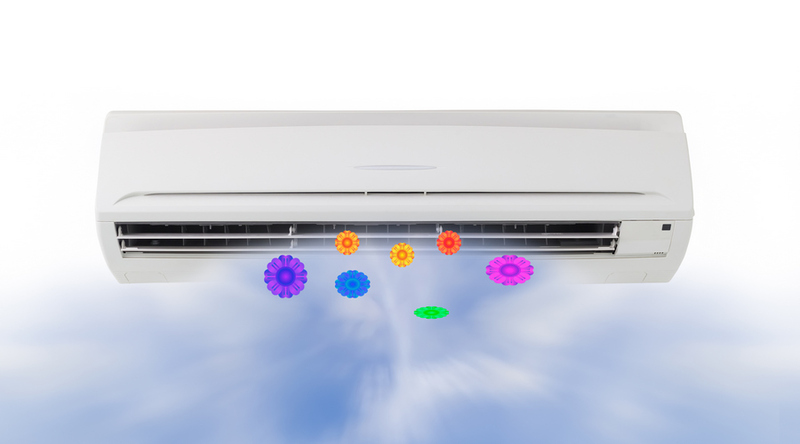 You see, a smelly air conditioner is usually caused by a couple of factors. One reason involves molds and mildew. This can accumulate because of the condensation happening on the refrigerator coils. It can also be any decaying debris. It can even be a dead animal that crawled into your air conditioner. Of course, poor maintenance can also be the cause of the foul odor coming out of the air conditioner. A dirty filter, drain line or drain pans can also lead to these funky smells. So what you can do to eliminate the smell? First of all, you have to identify the problem. Start by shining a flashlight in and around the air conditioner. You want to check the vents and the unit outside. Open the cover or the access panels of the unit. In case you have to remove any screws, draw a diagram to help you with reassembly later on. The next thing to do is to clean the unit. Once you have identified the problem, you should know what area needs to be cleaned. Definitely, a smelly air conditioner means a part of it is dirty. Remove any debris or dead animals that are causing the foul odor to emanate from the unit. Make sure you are wearing gloves. You can use a foaming coil cleaner to spray the coil. Leave it for around 10 to 15 minutes. This will give it enough time to loosen the dirt, grime, and oil that accumulated over time. Rinse this with water until clear. You should also remove your condensation drain line and flush it with bleach and hot or warm water. You can also use undiluted white vinegar – preferably the distilled one. The idea is to kill any mold or mildew that accumulated inside. Sometimes, this is what causes a smelly air conditioner. Dry this thoroughly. In case you have a window unit, you can see the drain pan and hole – that is what you should clean. You can use hot and soapy water and scrub the pan with an old toothbrush. For best results, you can clean it with a diluted bleach solution or the white vinegar used in the condensation drain line. Rinse it thoroughly and then let it dry before returning it. While you are at it, you may want to replace your filters too. You simply have to replace it – if you have disposable ones. But if the unit has reusable filters, you need to clean them with hot soapy water and rinse with a bleach solution. Once everything is done and you have reassembled it, you can turn the unit on to test if you still have a smelly air conditioner. If you have done everything correctly, it should be okay now. If not, it may be time to call in a professional to help you out. The problem may be in your duct work and that requires a trained professional.